Is your business protected from the dreaded Computer Crash? Did you know that 140,000* hard drives crash in the United States weekly? This alarming statistic has triggered many small businesses to switch to saving their files on a cloud or using a web based program (like UnitWise) that allows access to saved data anytime, regardless of the state of your computer. By choosing this proactive option all of your data is safe in a cloud, instead of being attached to a hard drive or software program. Only a small percentage of people update their anti-virus software plus backup files are corrupted from time to the time, leaving you and your sensitive business information vulnerable. How should you protect all of your customer contact information, inventory records, receipts, and credit memos? By switching to UnitWise you can access all of these files and information from any computer with an internet connection. You data is safe even if your computer is broken, lost or stolen. On top of that UnitWise has a great App for Android Tablets and iPad that allows you to store and manage your business information on the go. If you are a busy MK Sales director and using the help of an assistant for all your paperwork, just imagine how convenient it would be to allow her to work from the comfort of home or for you to not worry about assigning a different laptop for her. Well, the beauty of UnitWise is that it’s web based, so you and your assistant can work on your business records at the same time if you are logged into multiple devices. 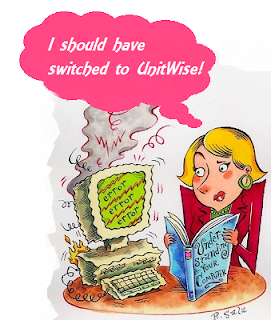 So would you choose the old method of backing up your information on a flash drive and storing it in your desk drawer, or are you the brilliant and resourceful business woman that chooses the cutting edge technology of UnitWise?